Lilium is the new small Aeronautics based Company that is entered into the realm of producing a full-fledged flying car that is capable of Vertical Landing and is deemed to be the most advanced flying car model designed uptil now. The German Company backed by its technically-skilled aviation engineers plans to launch its fully-electric, auto-pilot, two-seater flying car in the very first month of 2018. The flying craft which is an amalgamation of an aeroplane and a copter is a stream-lined and oval-shaped with a fixed wing-span. It can take -off and land like a helicopter and also acquire amazing air-travel speeds just like an aeroplane. The jet has a range of 500 kms and can acquire the speeds of 400 kilometres an hour. The aircraft is expected to be useful to overcome ‘traffic bottlenecks’ and short-duration flights. It is worthwhile to recollect that Lilium aircraft is pretty useful for the urban set-up because of its noiseless engines and capability to land and take-off vertically in a small square area that is 15 m in length. While comparing a the efficacy o a helicopter with a Lilium aircraft, a company pointed out that helicopters are too noisy and also require a lot of infrastructure to ‘build and maintain’ them, are difficult to fly and have lower safety ‘back-up’ in case of technical failure while in flight. But the new Lilium aircraft supplements all these discrepancies with fitting complementary system of batteries, engines and controllers that work in case of failure. Though Lilium craft can fly only in clear-weather conditions in uncongested air-traffic during daytime, it is still carries many cherishable advanced features.The jet being ultralight in weight qualifies as the light-sport aircraft and thus one can acquire a licence to fly it after just 20 hours of training. As already mentioned in previous post on Lilium jet, this feature is due to the fully-computer-assisted flying system set-up in the craft. It is very easy to recharge. Having been set-up just in 2015, Lilium has made significant progress with several scale, 25-kg prototypes having already been developed. The personal-aircraft design-venture was initially aided financially by the European Space Agency’s business incubation center AZO located in Bavaria, Germany. The CEO of AZO, Thorsten Rudolph maintained that a half-sized protoype has reached the testing stage as of now. Rudolph said, “The half-size prototype is already flying and now under test. The full-size unmanned prototype is planned for this summer,” Further Rudolph added ,“We are helping the Lilium team to turn their idea into a viable business. They are the aircraft experts, and we provide the expertise on how to make a business out of their dream.” Additionally, Lilium is also getting assistance for the project from another venture-capital investor. The maiden manned-flight is scheduled somewhere in 2017 and initial production is expected to start in 2018. 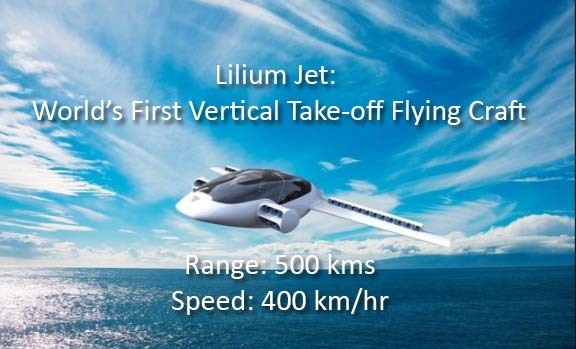 Lilium wants to back this by serial production of the flying jet which can be afforded by most people and be used as personal-flying craft just like a car.